Describes a Skype interview for a SFO startup in 2007. It was a friend-of-family for an unadvertised position on the other side of the world, so please don't judge me on my performance; instead take away that I found the challenge fun and wrote it up. Initially I was a fan of these tests as I saw it could screen out colleagues who could talk the talk but not walk it quite so well. But I fear the pendulum swings too far when online tests are used to preemptively filter candidates. I just did a Technical Interview for a San Francisco start up. This type of interview seems to be common in the US when looking for programmers. Despite being a complete flop at it myself, and this is the second time in my life I've been put through such - flopped that one too, I very much appreciate the concept. To make myself feel better I like to think there are very few guys I've worked with (in Sydney) who would be able to get this on the spot. If I could learn how to get through these tests then perhaps I'd actually get to work with some people who know what they're doing. The puzzle is perhaps a classic, at least it sure smells like a tried and true trick for sorting sheep and goats. A tree of nodes. 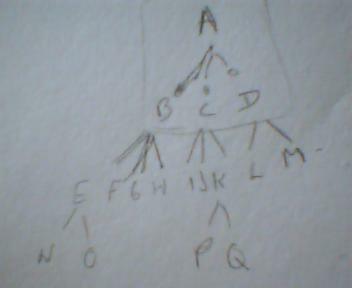 Each node has a label (eg "A") and some children. Write an iterator "next" such that it returns A, B, E, N, O, F, G, H, C, I, J, K, P, Q, D, L, M. You'll want to create a constructor for the iterator. Each node knows who its parent is. Sounds easy, and probably is. I couldn't do it. Still haven't solved it! But the 'next' node is still out of grasp; perhaps this is where the initializer comes in; to keep state in the walk you're on? I was instructed that the tree might be dynamic which ruled out walking the tree in the initializer then stepping through that list with each call to next(). The real trick seems to lie in finding the next() of Q; ie D via the arbitrarily deep ancestor A. I went to google and found some uni lecture notes which place a stack in the iterator which must be the solution which I never came close to finding. Like a dog to vomit I just kept on coming back to yesterday's puzzle. I've finally solved it. There is absolutely no way I would ever have got this thing out during an interview. It took me three distinct 'lightbulb' moments before I understood the solution. Ah-ha #1. You need a stack. To preserve some kind of state inside the iterator use a stack. Digging around some university lecture notes here and here I discover this is common knowledge to anyone who is familiar with the construction of iterators. Queues and stacks are the usual tools for keeping track of where you are. To start things off put the first node into an iterator and push that onto the stack. I can't pretend this possibility occurred to me at the time. I know it because I do recall feeling particularly pained over the question of whether or not the nodes were aware of the order of their children. At the time, this question formed a big grey cloud of confusion because here I was building an iterator so wouldn't assuming there's an iterator over the children be cheating somehow? In hindsight this concern was an unnecessary confusion. The way it was described to me there was obviously a sequence amongst the children. You have to be able get the kids some way! Having an iterater over the kids is not cheating here, just a little more convenient. Say the collection was unordered, like in a bag, it doesn't make a much difference to the solution: so you push unordered bags onto the stack rather than ordered lists. the object on the stack returns that something you haven't seen before. The main blocker here was that there are two distinct iterators: the single layer one to traverse the children, and the multi-layer one we're building to traverse the whole tree. This is probably a lightbulb in itself. So for this particular solution to the puzzle - as I imagine there are other ways to do it - is not to put nodes onto the stack. Ok, well you probably can, but it doesn't make life any easier because you still have the problem of finding the next node. Knowing where you have been is useful but leaves a lot of work yet to get a 'next'. I'm sure you could struggle through and achieve a brute force queue-based solution by putting nodes on the stack and digging through them, but it would be probably be ugly. The magic lightbulb? Push the ITERATORS onto the stack. After all we're interested in the next node, not the current one. Now, with a stack of iterators, we're in business! Want to know the next node? Well just ask the iterator at the top of the stack! Ok, but we still have problem: what do you do when the iterator at the top of the stack runs out of kids? I ran aground on the trailing edge condition repeatedly. Every time I thought it through I'd do a bunch of stuff and then find myself with the same problem: digging through an arbitrary number of dead ancestors to find the next node. In the end I cheated. No, not exactly. I just stumbled over this solution which was finished and working which was a vast improvement on what I had at the time. It uses recursion which I always like to see. But this solution includes a trick which I don't like: calling hasNext() changes the state of the iterator. The hasNext should be idempotent which, admittedly this is; but it does use side effects in hasNext to make next work. Tightly coupling these routines together strike me as a poor form. Ok, it's little inefficient to push empty kids iterators onto the stack only to immediately pop them off again, but its so pretty without a conditional there, and i'm well over this thing by now. Tada. I'm, finally, happy. I tell you again that I would never-ever-in-a-million-years have solved this inside an hour under any conditions ever. Reason? I'm getting older and duller? Even as a youngster I don't know that I could have solved this on the spot. One thing is sure: there is going to be one very bright collection of people in that startup.